Before nationalisation, Northern Rock was being touted to wood be buyers for sums as little as £200miln (Virgin bid) nationalisation, therefore the government announcements of recovering the £3.4+ billion investment on a sale of the bank amounts to just worthless propaganda as its not going to happen. If anything the government may have to throw in a sweetener for big bank to eventually take Northern Rock off its hands, therefore implying an even bigger loss for the tax payer. This is a far cry from what the government stated at the time of Nationalisation that NO TAX PAYERS MONEY WAS AT RISK. Which in the face of the £3 to £4 billion of capital injection is basically not true. You may wonder how Northern Rock has managed to repay the balance of 6.4 billion (£9.4 bill net of £3 bill injection), as clearly the bank is not making money from its mortgage business because it is actually losing money at the annualised rate of £1billion per year, therefore it has a lot to do with the bank putting the squeeze on mortgage customers through high interest rates as mortgages reset on fixed rate maturity, forcing mortgage holders to remortgage elsewhere which results in the repayment of existing mortgages that has seen the banks mortgage book shrink by over £13 billion. This also means that what Northern rock has increasingly left in its mortgage book are those mortgage holders that are unable to remortgage because they represent a greater risk of default or are already in negative equity. Another trick that Northern rock has deployed to good effect is to play on the fact that the bank has been nationalised and therefore implies 100% of savings are 100% secure as the bank is now part of the government, couple with high savings interest rates and Northern Rock has managed to attract several billions of savings through the door. The future is not bright for Northern Rock or the tax payer, as a poor mortgage book implies disproportionately higher rate of repossessions, as already Northern Rock is sitting on nearly 4000 repossessed properties that it needs to offload into a weak housing market so as to free up capital. The expectation is that the number of repossession over the next 12 months will continue to explode upwards which will leave Northern Rocks financial situation in a worse shape than where it is now and thereby implying further cash injections into the bank of untold billions. Which is basically means that the government is repaying the debt that Northern Rock owes back to itself so as the headlines can read "Northern Rock Repays Debt at Faster Pace"
Meanwhile Northern rocks push to shrink its mortgage book towards repayment of government loans by forcing mortgage holders to remortgage continues to put a drag on the UK housing market as I warned it would nearly a year ago as borrowers face an increasingly diminishing supply of mortgages products amidst a much tighter borrowing requirements . The government is busy also thinking up ideas to kick start the housing market in advance of an election for which a dead line loams, by trying to bribe people into buying houses in a falling market such as by means of a stamp duty holiday. There appears to be no real comprehension within the government institutions such as the Treasury and the Bank of England of the requirements for markets to value assets based on fundamentals, any attempt at market manipulation will make matters far worse and more costly in the long-run as the nationalisation of Northern Rock increasingly illustrates. The prospects for the UK mortgage sector looks increasingly dire, with the UK housing market in full house price mode, With all of the major mortgage banks such as Bradford and Bingley, Alliance and Leicester and even the mighty HBOS feeling the pain from the existing forecast for downtrend of a 15% drop over 2 years as of August 2007 . Which will be the next Northern Rock ? Well we come close to Bradford & Bingley going down the route towards Nationalisation as its rights issue was destined towards failure in July which required arm twisting by the regulators for the big UK banks to step in and buy unsold shares. 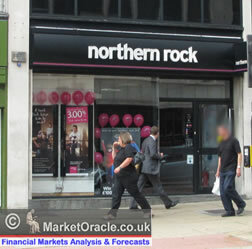 18 Feb 2008 - Northern Rock Bank Nationalised- Which Bank will be Next?